The Maitland Liquor Accord Inc. is a voluntary association of licensees and local businesses. We take a proactive approach to managing alcohol in the best interests of the community and the industry. We provide strong networking opportunities, and collaborate effectively with police and government and advocate for the interests of the liquor and hospitality industries. The Maitland Liquor Accord Inc. is successor to the original Maitland Liquor Accord formed in 1999 and one of the oldest in NSW. Maitland Liquor Accord Inc. has inherited the good standing in the community and collaborative mentality of the old Accord. We are a not-for-profit incorporated Association run independently for the good of our members and of the wider community. 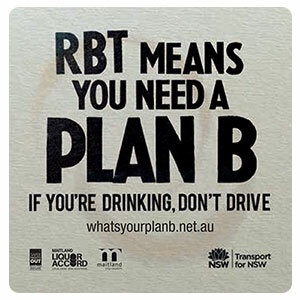 1) To promote the Community wellbeing by reducing the adverse effects of alcohol consumption. Alcohol related presentations to the Emergency Department of the Maitland and neighbouring Hospitals. Complaints by the community where such complaints are alcohol related or contributed to by Licensed Premises. Costs of alcohol related issues to the Community, including the cost of policing, health services, Council, business and the residents. 2) To facilitate and encourage responsible consumption of alcohol by residents and visitors. Patron and schools-based education programs addressing the affects of alcohol, so as to minimise the incidents of alcohol related harm. A contact point and information resource for members of the Association and residents of the Area to address alcohol related issues. Information on convenient and safe transport alternatives, particularly for patrons leaving Licensed Premises. 3) To promote the Accord as a voluntary based organisation addressing alcohol related issues within the Community, and Maitland’s licensed premises as responsible service providers for alcohol. 4) To promote Maitland as a location where residents and visitors have enjoyable and safe experiences, where their security and their amenity are attributable to the absence of alcohol related issues. 5) To encourage all Licensees within Maitland, and other appropriate persons within the area to become members of the Accord, and to encourage an active participation in Accord projects and strategies by the by Accord members.